Zabava Guest House is the perfect place to experience Ao-Nang, Krabi. Just a 2-minute walk from the white sands of Aonang Beach. The cosy rooms with a safety deposit box and free Wi-fi are available. 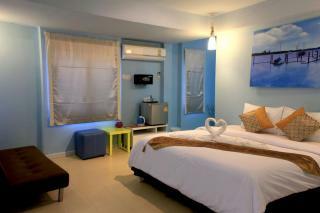 Comfortable rooms are equipped with air conditioning, TV and refrigerator. En-suite bathrooms come with shower facilities. of services, including free Wi-Fi in all rooms and public area, luggage storage, airport transfer and family room. For convenience, a laundry service is also available. Enjoy a variety of local dishes at many restaurants located within a -minute walk from the residence.